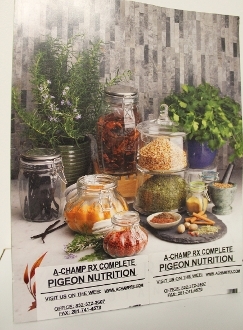 A-CHAMP RX COMPLETE PIGEON NUTRITION! !FROM THE NEST TO THE BEST ! !FREE SHIPPING ORDER $125.00 AND OVER. I recommend A-Champ Rx Complete Pigeon Nutrition , because I receive positive results from pigeon fanciers all over the World!! The 100% All-Naturals products helps to keep the bird in excellent health, and that decreases the chances for any illnesses.... A-Champ RX products uses the highest quality ingredients and the results speaks for itself. I like the all natural product line that gives the birds the winning edge, excellent health without the side effects that come from so medicine. ~ Freddie Rivera﻿, Saint Petersburg,Florida. I do not give a testimonial without testing and positive results due to my engineering background. A-Champ Rx has eraned my recommendation due to the actual results of their products line. My young bird team flown by Thomas Williams in 2012 earned 2nd place champion loft and would have been 1st. place except for one race without any points due to an clock erre. A-Champ RX products maintained exceptional bird health. I also had 1st place champion bird in the state of Texas until the last race. I like the all natural product line that allow me to improve bird health without the side effects that come from so many of the medicine cures. Revive Red contains Electrolytes, with Proteins, Vitamins, and minerals, Organic Beet Root, and veggies. This supplement also contains natural anti-inflamatories. It also helps in the elimination of Lactic Acid from the body and a strenuous traing and long races. Copyright © 2012-2019 A-CHAMP RX COMPLETE PIGEON NUTRITION!!. All rights reserved.